The thought of baking without good 'ol all purpose or cake flour makes me nervous. Big time nervous. Then, subtracting granulated sugar on top of that? Hole-E-Cow, watch out. I just might throw that recipe out the window. Here's the twisted truth though- I love eating foods and desserts that are made without the two! I will so very much pick up something labeled "whole wheat", "whole grain", "gluten free" or "made without sugar" before I go for the sugary stuff. I actually try my super duper hardest to eat most of my meals white starch and white sugar free! It's just the "baking it myself" part that scares me. Sure sure, there's all those fancy gluten free flours and crazy "sugars" out there (maple or coconut sugar anyone?) 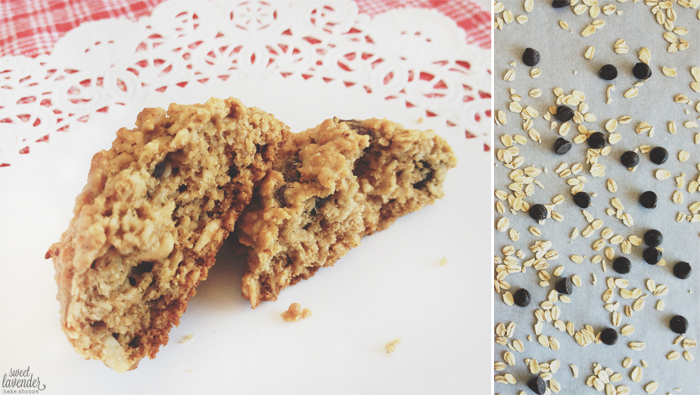 that make baking without standard white flour/sugar totally doable. And mad props and big high fives to those glorious companies who are making those that have to eat gluten free or sugar free have an easier time doing so! It's amazing what they're coming out with, huh? Gosh! I just love it. For me, I don't necessarily "need" to eat such a way. I choose to because I know it's better for me, AND I actually do feel a bit better when doing so. Also, I don't know if you're anything like me, but I don't have the space in my home nor the money in my wallet for all those different ingredients. What I do always have on hand is oatmeal, almond meal, maple syrup, raw organic honey, coconut oil, butter, and natural peanut butter. I've found that these few simple ingredients can go a long way in this new territory I'm boldly venturing in: The Gluten Free and Sugar Free World. It's within those simple ingredients that these cookies were born. I love them. I love that there's no white flours, or flour at all for that matter. I love that there's no white sugar, but instead a douse of good ol bee's honey. (**Note, because I'm not health-wise super strict with my sugar, there is indeed chocolate chips. The little bit added doesn't worry me. If you're needing a total sugar free substitute, please feel free to leave out, add cocoa nibs, or any other sugar free chocolate chip alternative) I also love that with the little bit of butter and natural peanut butter- the fat content between the two makes a moist and soft delectable cookie. 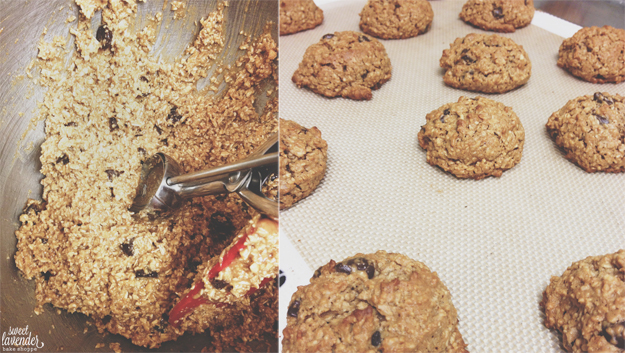 I love that with a few simple, honest, and easily attainable ingredients you can have a feel good dessert. In cookie form none the less. 1/2 cup natural peanut butter (I used crunchy), stirred well! 1. Preheat oven to 350*F and line 1-2 sheet pans or cookie sheets with silpats. If you do not have silpats, parchment paper will work as well. Just watch the bottoms of your cookies while baking. 2. 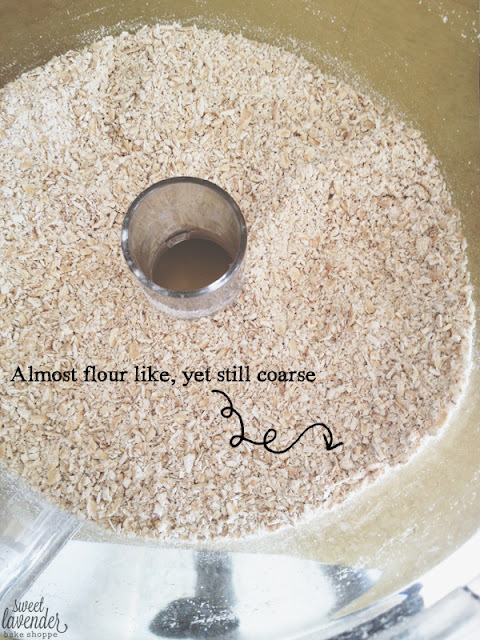 Add your 2 1/2 cups rolled oats to a food processor and run until a coarse flour is created- about 30-45 seconds. 3. In the bowl of a stand mixer, add your room temperature butter and honey. Beat with a paddle attachment until completely combined, about 1 minute. Turn mixer off and scrape sides and bottom of bowl. 4. Next, add your egg and vanilla extract and mix again until thoroughly combined. 5. Stop mixer and scrape down bowl again. Next, add your 1/2 cup natural peanut butter. Mix well. 6. In a separate bowl, mix together newly made coarse oat flour, baking soda, and your salt. While mixer is on a slow speed, add your oat mixture and combine until just coming together. Add chocolate chips and mix again. 8. Onto your silpat lined baking sheets, scoop dough out with a 1.5" ice cream scoop. You can also use a tablespoon to do the same thing. Place about 1.5" apart. I got about 14 cookies per sheet. 9. Bake cookies in the middle of your oven for 10-12 minutes (turning half way through baking time). Your cookies are done when they have risen and are golden brown around the edges. Remove from oven and allow to cool 2 minutes on cookie sheet and then completely on a cooking rack. **Put dough back into fridge when not using. These cookies come out puffed and golden, bursting with flavor, and soft as pillows. 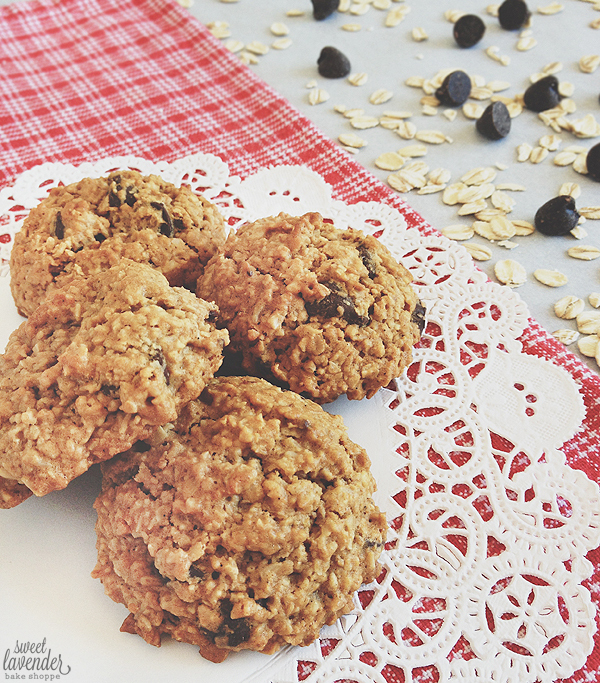 Who would have thought a cookie made without the use of flour OR sugar could be so good!